There's a rich tradition of chick stuff getting manned up to make it guy-applicable, from salad (just put steak in it), to birth (just put it in Arnold). Next in line: millinery hats, thanks to DeAnna Gibbons. A one-woman Mission operation, DG uses millinery's traditionally for-females steam pressing (vs. the hot sand press rigidity of male-focused hatters) to churn out pliably custom, swanky man-lids for the likes of Barneys NY, the SF Opera, the Black Eyed Peas guy who does that one awesome song about wears a cool hat...and now, you. 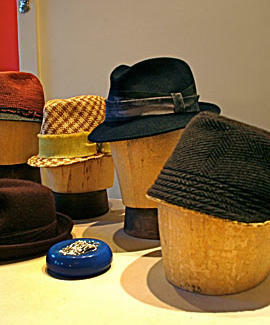 To develop your dream cranium-cover, stop by DeAnna's studio with a look in mind, and she'll run through a variety of silhouettes (stingy-brim fedoras, fisherman-ish flop-downs, all-fabric offerings w/ warm ear flaps, etc), then let you select your hat's base materials -- anything from variously colored felts, to shiny/woven Milano straw, to not-too-coarse alpaca fur, which you can point out to everyone you spit on. Next, it's on to bespoke options for trim (e.g., leather, deadstock 70s ribbon, macaw feathers), and pressed-on hardware flare like antique brass/nickel buttons, vintage metal buckles, and eyelets and grommets to reinforce fashionably placed holes/your masculinity in light of those macaw feathers. If you've got a specific headwear-demanding occasion in mind, bring the suit or outfit you're wearing, and DeAnna'll happily match your colors on the spot; turnaround on any custom job is typically three to six weeks -- coincidentally, about the same amount of time it took Junior to gestate in theaters before emerging slimily onto VHS.